This page provides a video archive of presentations at the annual SSEP National Conference by student researchers whose experiments were part of the SSEP Mission 4 to ISS Orion experiments payload. Mission 4 to ISS was the sixth SSEP flight opportunity. Orion launched on Orb-1, 10:42 pm ET, January 9, 2014, from the Mid-Atlantic Regional Spaceport, Wallops Island, Virginia. Orion returned to Earth on Soyuz 36S, landing in Kazakhstan on March 10, 2014. For details on the flight profile for Orion, see the SSEP Mission 4 to the International Space Station (ISS) page. Some student flight teams present at more than one annual conference, reporting out status at various stages of the life cycle of a flight experiment. It is also true that not all student flight teams attend a conference. For details on all Orion flight experiments, see the Selected Experiments on SSEP Mission 4 to ISS page. Title: What Are the Effects of Creation of Beer in Microgravity and is it Possible? Abstract: By combining the four main ingredients of beer in space, how much alcohol will be produced? If an emergency occurred, alcohol would disinfect polluted water, and that is cheaper than purifying it with standard procedures. Alcohol kills bacteria, and it can also be used medically to disinfect wounds. The results are useful for medical and financial purposes. The experiment is easy to conduct with limited interactions. It was designed to test differences in fermentation alcohol levels between Earth and space. Abstract: The Laker team is investigating the effects of microgravity on calcium absorption by bones. Astronauts lose 15-30% of their bone density in space. People on Earth consume calcium supplements to help improve or sustain bone density. We will use calcium and two sections from the same bone: 1) control bone on Earth and 2) experimental bone on ISS. Our analysis will be quantitative since we will weigh, measure and, micro-CT scan the bones. Abstract: The experiment will test if silver crystals can be formed in space and if they are similar to those formed on Earth. This is being tested because crystals can store natural gas due to their porous and rigid nature. It is predicted that crystals will form in space with the same features as on Earth because the actual formation of the crystals is caused by a chemical reaction which is believed to be independent of gravity. In this experiment, the crystals will be compared based on their color, average size, symmetry, number of faces, and mass. Abstract: The purpose of our experiment is to observe the effect of microgravity on live tardigrades and tardigrades reactivated in space. Tardigrades are known for their capabilities in surviving in the most extreme living conditions such as hot and cold temperatures, high levels of radiation, boiling alcohol and even high pressure. Tardigrades undergo a process where they go into a temporary dormant state called cryptobiosis. We will be comparing for any structural and behavioral differences between the two experiments. Abstract: The purpose of this experiment was to observe how microgravity affects the dissolution of the microencapsulated extended release medication, Aleve. The microencapsulated Naproxen, the active ingredient in the drug, was released into a solution of hydrochloric acid, deionized water, sodium chloride, and potassium chloride. Comparing the concentration of dissolved Naproxen in space and on Earth determined the strength of microencapsulation in microgravity. Discovering these effects demonstrates the influence of gravity on the function of microencapsulated medicine. Title: How Does Microgravity Affect the Oxidation of Iron in a Saltwater Solution? Abstract: The purpose of this experiment is to examine the structural integrity of an iron tensile bar immersed in a saltwater solution in microgravity. It is believed that the surface tension of water in microgravity will change and increase the rate of oxidation on the iron tensile bar, decreasing its structural integrity. Knowing how microgravity will affect the oxidation of metals is important when designing manned spacecraft and containers on the International Space Station. Abstract: A study of corrosion of an iron rod in a saltwater solution is proposed. It is hypothesized that corrosion in microgravity will exceed that of the control, as the stronger effect of surface tension in microgravity increases contact of the iron rod and the salt water. The experiment will use a Type 2 FME. Corroded rod strength will be measured with a tensile machine, and the surface structure examined with a scanning electron microscope. Title: How long will erythrocytes take to coagulate in a micro-gravity environment? Abstract: The effects of microgravity on the coagulation rate of erythrocytes are examined in this experiment. It is hypothesized that erythrocytes will live a shorter amount of time in microgravity. Ground truth experimentation includes the use of dye to determine the life span of a red blood cell. Abstract: An experiment designed to study the effects of tin whisker formation on a lead-free solder testbed is proposed. The testbed would have been analyzed with a scanning electron microscope to observe tin whisker formation over a periodicity of many years. Ground truth experimentation includes a metal substrate with lead-free solder for data analysis. Title: How Does Microgravity Effect the Mold Growth on Gerber Graduates for Toddlers lil’ Biscuits? Abstract: Students will discuss an overview of mold. The students also share the procedures used to determine the amount of water used in the mold growth experiment and how they learned that that the ideal mold growth for their experiment occurs when there is an equal amount of biscuit and water. Students also discuss the procedures used to prepare the mold experiment for microgravity. 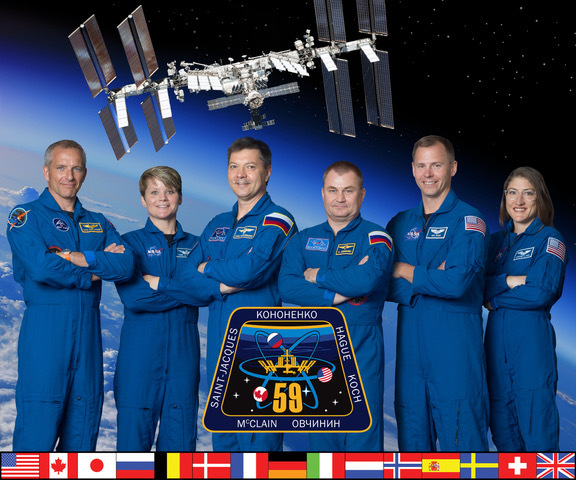 During the spaceflight, the student team will conduct two identical experiments – one on the International Space Station and one in their classroom – to see how gravity affects mold growth. Pending the return of experiment, students expect to find that mold will grow faster in microgravity than on Earth because the mold spores are adapted to gravity. In microgravity, they will have no pressure to contain the growth of the mold.